Just a day after a zookeeper was killed in Palm Beach, Florida, a woman jumped into a tiger enclosure at another zoo in Toronto. 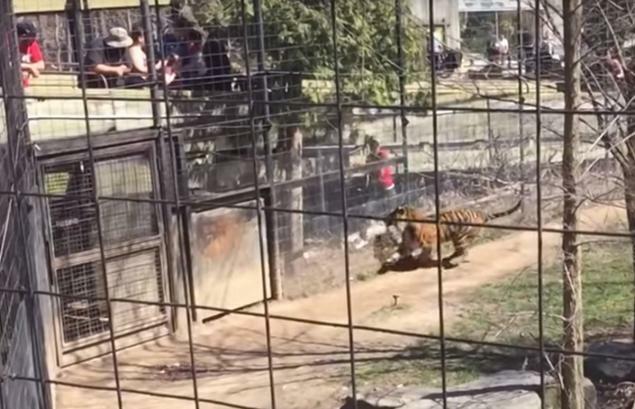 The video posted to Youtube on April 16, shows a woman climbing over a fence to retrieve a hat as an anxious tiger looks like it’s about to pounce. The tiger is within a double-fenced enclosure, but still that’s not a place you want to be. An official at the Toronto Zoo, where the incident takes place, says the woman was safe although it was an ill-advised move. Following the incident a fellow guest can be heard berating the woman for being an idiot. The scene played out just a day after a zookeeper at Palm Beach Zoo was killed by a tiger during a routine event. Stacey Konwiser, 38, was the lead tiger trainer at the zoo who one friend called the tiger whisperer. It’s unclear what exactly led to the deadly encounter, following which the tiger was tranquilized. No word yet on what will happen to the animal as an OSHA investigation has been launched. The accident happened around 2 pm in an area removed from the view of guests where the animals are fed and sleep, reports CNN.